Like all games Eve gives you the ability to personalize your little animated figure with a biography where you get to put all sorts of interesting things. Bios are random. Sometimes there is not one, sometimes they are awful. Many times they become places to hold amazing quotes and amusing links. The ones that make me scratch my head the most are the ones that are a list of damage type information. 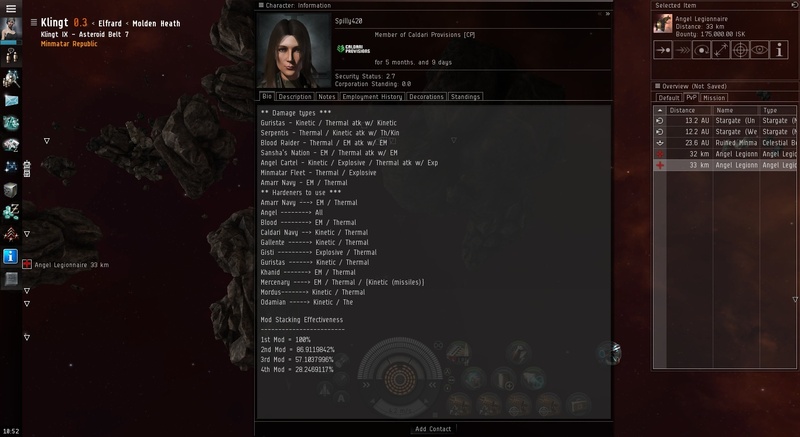 Eve has a notepad that you can use. Its a great place for storing details and information to access. For some reason, however, people put it in their bio. There are many reasons for this. Some are lazy and clicking on their own name is easy. For others, its used as a way to make people think they are mission runners and not PvP types. For others, I don't know. Its one of those random, weird thing in the game I guess. Honestly, my FW-alt has some fake information like this as a joke. But now that I'm reading this, I'm a bit embarrassed. Maybe I should erase the fake damage type information and finally write a real bio.